The Best Florida Birding Guide for Canadian Snowbirds! In fact, birding comes in at number two right after beach activities as the most common form of time spent outdoors. Birding is becoming increasingly popular especially with the 55 plus set and can range from a general interest in birds to carrying binoculars, visiting bird sanctuaries and using cameras with telescopic lenses. While this pastime can be enjoyed in many snowbird destinations, Florida is considered one of the best places in the world for birding. There are so many species here, particularly in the winter months. You’ll find local wading birds, as well as hawks, eagles and subtropical birds - and then there are the birds which migrate from further north, even from Canada, en route to Central and South America. What general advice would you give snowbirds interested in birding in Florida? Get a field guide! Bookstores at reserves and sanctuaries are the best place to find a good selection. You’ll also find specific guides just for Florida. When you see a bird, get as much information about it as you can. Listen for calls and songs, and note habitat and any interesting behaviour. When you look up a bird in the guide, look for bird families that are similar to your bird. Look at the range maps or other information that shows where they can be expected and the times of the year when sightings occur - as well as actual illustrations to help you identify the birds you see. Take binoculars (they can be rented at some reserves and sanctuaries) and take a few moments to familiarize yourself with how to use them. Have the eyepieces the right distance apart so that you see a circle. Focus at about the distance that you are likely to see a bird. When you see a bird, try to keep your eye on it then lift the binoculars to your eyes, looking for a familiar pattern in the background that will help you locate it. Bring it into sharp focus. Take advantage of guided trips that are offered at many reserves and sanctuaries. That will get you started and acquainted with the local specialties. What species of birds can visitors to Florida expect to see during the winter months of November through March? Some birds pass through Florida when heading somewhere else in the spring and autumn months. Others come from the north and spend the winter. Most of the conspicuous birds you see from November to March are not actually migrating - either they are year-round residents or they are staying for the winter and will migrate somewhere else for the summer. The birds that Canadians will notice are the big wading birds like herons and egrets – several different kinds. You will also see Wood Storks, Roseate Spoonbills and White and Glossy ibises. 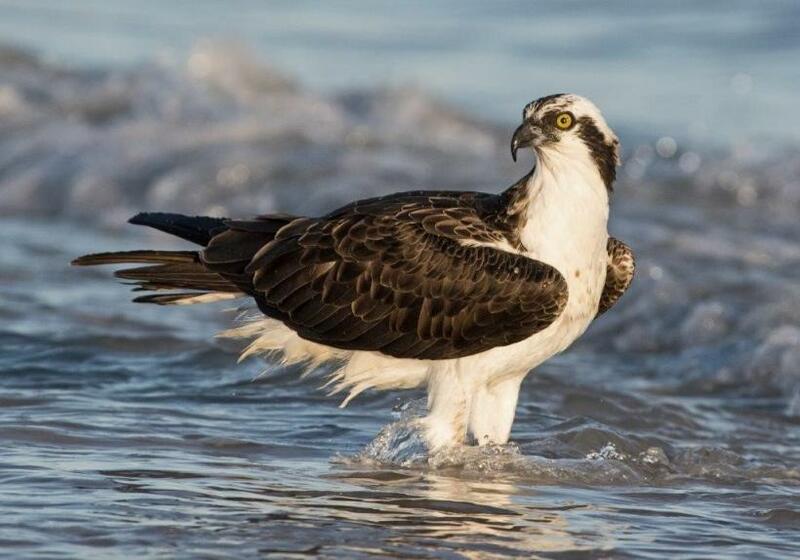 There are also the birds of prey like ospreys, American bald eagles and Turkey Vultures, and of course the pelicans. Though flamingos are considered a Florida icon they are actually quite localized near Miami and the southwest Everglades. Are there different regions of Florida where different species would likely be seen? Coastal beach areas have a wide range of shorebirds such as sandpipers that forage along the shoreline, as well as seagulls, terns and skimmers – who have a long lower bill and fly low over the water catching surface prey, often at dusk. A favourite pastime for birders is watching Brown Pelicans, the ones that dive into the water and White Pelicans, which can be seen working together on the water to corral their prey. These birds are often used to people and are much tamer and easier to see in Florida than elsewhere. The coastlines also have mangrove swamps which have roosts of large wading birds as well as some specialty smaller birds like the Mangrove Cuckoo. The pinewoods that still remain in Florida are worth visiting for their own sake and have their own special birds, like the rare Red-cockaded Woodpecker and a selection of sparrows and warblers. The inland prairies are less familiar to most visitors to Florida - they are often ranch lands, primarily near Lake Okeechobee and the central regions of the State. These prairies are host to a range of birds including the Sandhill Crane, Crested Caracara, American Kestrel and the Loggerhead Shrike - a songbird that preys on other birds, reptiles and insects. What areas of Florida are best known for birding? There’s actually a 2,000 mile birding route in Florida known as the Great Florida Birding and Wildlife Trail where you will find over 500 birding and wildlife viewing spots. Here’s a link to the Great Florida Birding Trail that will help you plan your birding outings in Florida. The best known region is probably the Everglades National Park, which has a wide range of exotic-looking water birds like herons, storks and gallinules. Many are colourful and can be seen at close quarters. The "Ding" Darling National Wildlife Refuge on Sanibel Island also has many of the same birds. The Corkscrew Swamp Sanctuary near Naples has a boardwalk trail through a range of bird habitats including a virgin Bald Cypress swamp. There are opportunities for good views of wading birds, Red-shouldered hawks, woodpeckers, vireos, warblers and the wildly colourful Painted Bunting. The Lake Okeechobee Scenic Trail allows you to tour in your car around Lake Okeechobee, the second largest lake in the South. There you’ll see Herons, egrets, and wintering waterfowl around the lake. In the prairie regions you’ll see Crested Caracaras, Burrowing owls and Sandhill cranes. In Palm Beach County there’s Grassy Waters Preserve which comprises two sites. One features a nature center and a 1,500 ft. boardwalk overlooking both prairie and marshland. The second site has a lake where some fishing is permitted on a catch and release basis and guided canoe expeditions are available. The prairie and marsh attract Great Blue herons, Great egrets, ibises, limpkins, Turkey vultures and Red-shouldered hawks. Snail kites and Bald eagles are occasionally seen as well. Near the lake you will see wading birds, ospreys and wild ducks. Merritt Island National Wildlife Refuge plays host in January to the annual Space Coast Birding and Wildlife Festival. Birders come from far and wide to see migrating water birds and shorebirds along Black Point Wildlife Drive around the salt marshes. If you are willing to take the over water drive out through the Florida Keys, then Dry Tortugas National Park is well worth it. In the spring you might catch the rare sighting of Sooty terns and Brown noddies nesting on Bush Key.